Long after the canoes, kayaks and life jackets were put away for the summer, a group of young adults headed north to Catholic Youth Camp on Big Sandy Lake near McGregor. The weather was too cold for things like swimming on the weekend of Oct. 3-5, but that didn’t faze Natalie King. She wasn’t there to swim. She was there to get married. But, as recently as May of this year, King wasn’t sure she would fulfill her dream of marrying Nate Whited in the camp’s cozy chapel. Camp, which opened in 1947, was struggling financially, and a neighbor had made an offer to buy it and convert it for other uses. As leaders and the board contemplated the buyout offer, King reached out to camp alumni, staff and parents who send their children there. She wanted to know how they felt about having CYC come to an end. As it turns out, the response was overwhelming. Offers to help keep camp open came rolling in from people like Jean Murtaugh, whose two daughters, Jena, 12, and Maggie, 9, have been going to camp for the last four years. “I told Natalie I would do anything I could to help keep the camp open,” said Murtaugh, who attends St. Francis de Sales in St. Paul with her daughters and husband Jeff Marcolina. “The camp is a wonderful, faith-filled place where we feel our children are safe and the staff is like a family. It is truly a very special place. Every day, they are immersed in the Catholic faith and live a Catholic life while they are there. They attend Mass and always come home singing songs of praise and worship. Murtaugh’s message was loud and clear to King and the board, which made a decision to keep camp open. There will be an overhaul of the whole organization along with a new strategic plan that will emphasize fundraising. Thus, the 67-year legacy of CYC will continue. 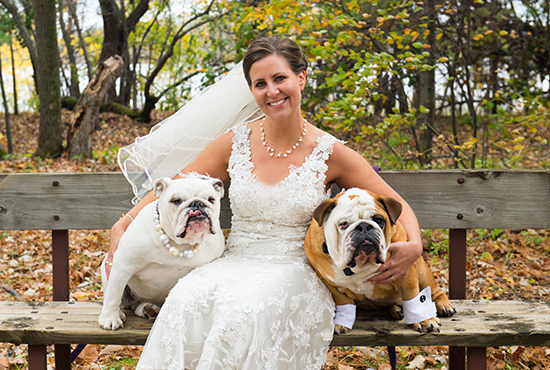 This “family” comes complete with camp dogs, a pair of English bulldogs named Griffin and Olivia who are so much a part of the summer experience that they walked down the chapel aisle at King’s wedding. It seemed fitting, given the important role they play for nine weeks every summer. “They help out with homesickness and sometimes they just wander around,” King said. “They’re pretty cute. The kids love them.” Next summer, the dogs will be back, and the newlywed camp leader couldn’t be happier. For more information, visit http://www.cycamp.org or call (651) 636-1645.